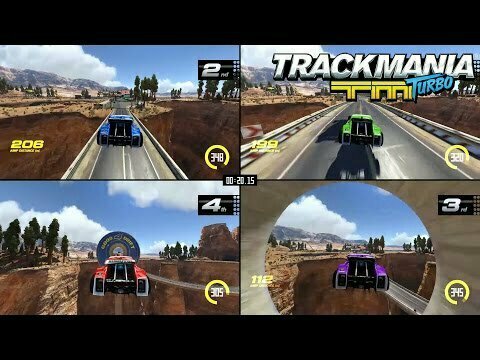 I thought as Trackmania Turbo hits Games with Gold it would be a good time for me to take a look and let you know my thoughts. Trackmania offers you the ultimate arcade racing universe. Test your skills in outlandish tracks and challenge your friends at home in split screen or online around the world. Rollercoaster Lagoon; Defy Gravity in a tropical paradise, racing on magnetic tracks. International Stadium; Use your driving skills to master the tracks of this worldwide competition. Canyon Grand Drift; Drift your way through narrow tracks in this red canyon landscape. Down & Dirty Valley; Use air control and jump through the hills in this countryside setting. Campaign Mode; Unlock up to 200 tracks in over 5 difficulty levels. Drive your way to the tops of worldwide rankings. Double Driver; For the first time in a racing game, team up with a friend and control on car with two controllers. Trackbuilder; Design your own tracks or simply generate random ones. Save and share your best tracks to make the competition last forever. Reviewed on Xbox One also available for PlayStation 4 and Windows. The look of this game kind of got me straight away, the cover shows the looping tracks… I mean come on, what racing fan wouldn’t want to try that? I got straight into the multiplayer split screen action with a race against my son, we chose Rollercoaster Lagoon to start with. You get air lifted into the action and dropped off at the start point; the fast paced action is there from the off, takes a little getting used to the controls as the cars are quite nippy and you do find yourself crashing a few times. Roaring around these circuits is pretty fun as the tracks are insane, especially when you hit the first Rollercoaster loop, this is where it gets a little annoying for me as I always play racing games in 3rd person view so I can see the car and find it easier to control, although you can start this way, as soon as you hit the loop you are flung into first person mode, which is where I more often will crash annoying the life out of me. After a few laps it does get easier to combat the controls and the wins start to flow. You can have up to 4 players on split screen making the couch co-op championships a lot more intense. Online multiplayer is you pitting your lap times against the others in the lobby for the top spot and is a lot of fun and gets very competitive. I tried this out in Canyon Grand Drift and once I got the hand of drifting around corners I really enjoyed the fast pace track. Online also enables you to try out other players custom tracks and let you come up with your own insane track inventions sharing them with the community; here is where the only limits are your imagination. Campaign mode or single player if you like is your normal racing arcade, start from the first track and work through until you have unlocked all the different tracks. Although I did find campaign mode fun and quite addictive it does become quite repetitive and very “samey” after a while. The graphics for Trackmania are pretty good and throughout the fast paced racing the graphics seem to handle really well and I’m yet to see any graphical problems. The cosmetic damage is there as if you land a jump awkward you will see your spoiler fly off. With regards to the sounds, the music is a good match to the game fast paced and bouncy, the voice over is as over the top as the game itself which is kind of good, although the countdown at the start of every race is in foreign which is somewhat confusing and slightly annoying. To summarise then Trackmania for me is a great multiplayer title, whether it’s local on the sofa which is indeed a lot of fun, or challenging times online it really is a lot of fun and very competitive. The track choice is like no other (apart from Hot Wheels dlc for Forza Horizon 3), the multiplayer part of the game for me has true potential for longevity in the way you can just pick up and have a quick go and move on there isn’t no in depth aspect of it. The online side of it is massive as there is a huge following online with regular leagues and tournaments taking place, single player part of it is good but I can’t see it having the same lifespan as multiplayer. For the price (well it’s free until 30th Nov)it’s definitely worth adding to your collection if you are Arcade racer minded, and even if you’re not, its a pretty good laugh. Single player gets a bit "samey"
South Park: The Stick Of Truth Coming To Switch, Fractured But Whole DLC Coming Too!